The tensile strength of concrete is one of the basic and important properties which greatly affect the extent and size of cracking in structures. Moreover, the concrete is very weak in tension due to its brittle nature. Hence. it is not expected to resist the direct tension. 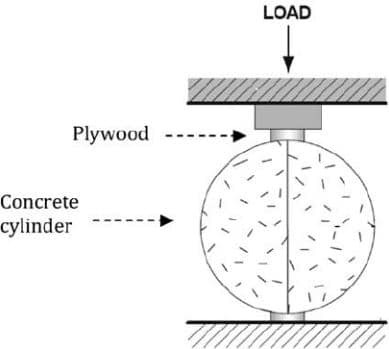 So, concrete develops cracks when tensile forces exceed its tensile strength. Therefore, it is necessary to determine the tensile strength of concrete to determine the load at which the concrete members may crack. 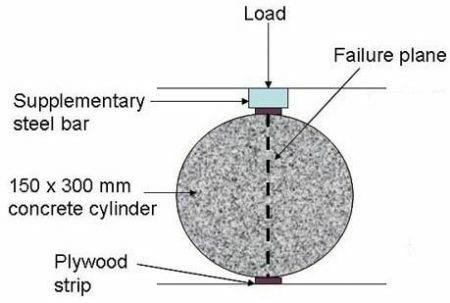 Furthermore, splitting tensile strength test on concrete cylinder is a method to determine the tensile strength of concrete.The procedure based on the ASTM C496 (Standard Test Method of Cylindrical Concrete Specimen) which similar to other codes lik IS 5816 1999. 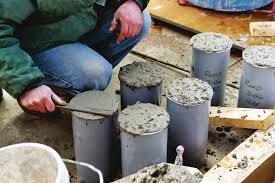 Finally, different aspects split cylinder test of concrete specimen will be discussed in the following sections. Firstly, it shall conform to the requirements of Test Method C 39/C 39M. Thirdly, it should be able to apply loads at a constant rate within the range 0.7 to 1.4 MPa/min (1.2 to 2.4 MPa/min based on IS 5816 1999) splitting tensile stress until the specimen fails. It is employed when the diameter or the largest dimension of the upper bearing face or the lower bearing block is less than the length of the cylinder to be tested. it shall be used in such manner that the load will be applied over the entire length of the specimen. Two bearing strips are used. 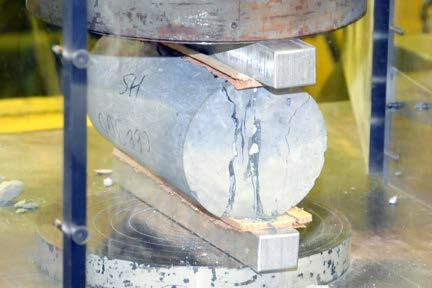 The bearing strips placed between the specimen and both the upper and lower bearing blocks of the testing machine or between the specimen and supplemental bars or plates if needed. It shall be made of steel, and 3 mm thick. The mould shall be capable of being opened longitudinally to facilitate the removal of the specimen and is provided with a means of keeping it closed while in use. The mean internal diameter of the mould is 15 cm ± 0.2 mm and the height is 30 +/- 0.1 cm. The moulds are provided with a metal base plate mould. Moulds need to be coated with a thin film of mould oil before use, in order to prevent adhesion of concrete. It shall be a round, straight steel rod with at least the tamping end rounded to a hemispherical tip of the same diameter as the rod. Both ends rounded, if preferred. Tamping rod diameter is 16 mm and its length is 600 mm. After the mixture is prepared, it is poured into the oiled mould in layers approximately 5 cm deep. Then, each layer is compacted either by hand or by vibration. For manual compaction, use tamping bar. 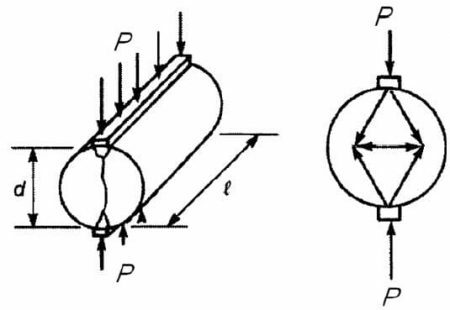 Distributed bar stroke uniformly in order to compact it properly. Minimum tamping bar stroke for each layer is 30. Lastly, the surface of the concrete should be finished level with the top of the mould,using a trowel and covered with a glass or metal plate to prevent evaporation. 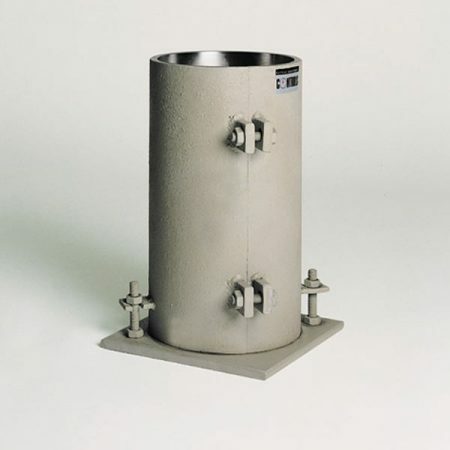 Casted specimen should be stored in a place at a temperature of 27° +/- 2°C for 24 +/- 0.5 hrs from the time addition of water to the dry ingredients. After that, the specimen should be marked and removed from the mould and immediately submerged in clean fresh water or saturated lime solution and kept there until taken out just prior to the test. 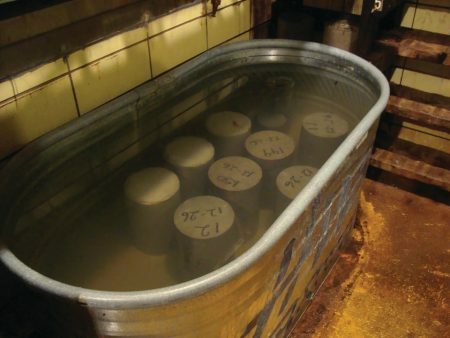 The water or solution in witch the specimens are kept should be renewed every seven days and should be maintained at a temperature of 27° +/- 2°c. For design purpose, the specimen cured for 28 days. At last, for each reading, three specimen shall be casted and tested. Then, the average tensile strength will be taken. Initially, take the wet specimen from water after 7, 28 of curing; or any desired age at which tensile strength to be estimated. After that, draw diametrical lines on the two ends of the specimen to ensure that they are on the same axial place. Next, record the weight and dimension of the specimen. Set the compression testing machine for the required range. Place plywood strip on the lower plate and place the specimen. Place the other plywood strip above the specimen. Bring down the upper plate so that it just touch the plywood strip.